Indian farmlands will now need to focus on the adoption of technology to generate the required profits. 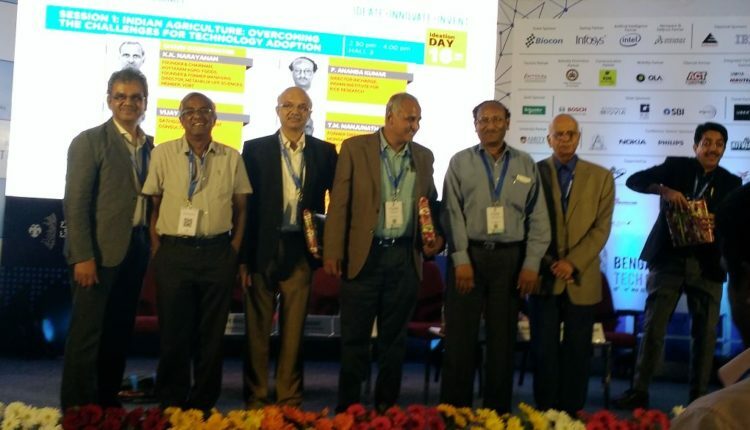 This was stated by agricultural experts during a panel discussion, titled Indian Agriculture: Overcoming the Challenges for Technology Adoption at the Bangalore Technology Summit 2017, which is underway in Bengaluru and will conclude on November 18. They added that it was high time solutions were sought for the growing problems faced by the sector. The panel was chaired by K K Narayan, founder and chairman, Kottaram Agro-Foods, and comprised V Ravichandran, practicing farmer, author and founder of Proagro Group; P Ananda Kumar, director in-charge, Indian Institute of Rice Research; T M Manjunath, former director, Monsanto Research Centre; Vijay Paranjape, vice-president and lead innovation advisory, Sathguru Management Consultants, and Bhagirath Choudhary, founder director, South Asian Biotechnology Centre. They went to deliberate on such topics as innovation dissipation, farmers’ reception to technology and other issues pertaining to agricultural technology. Ravichandran highlighted the issues faced by the farmers, including profit margins, the non-availability of genetically-modified (GM) seeds, the cost of farming technology and the abundance of scaremongering tactics used by activists to defame science. Arguments were acknowledged by the rest of the panel, which went on to deliberate on the issues in the government, including the regulatory challenges. “Technology already exists on Indian shelves to increase the profitability margins of farmers by 30 per cent. The regulatory body needs to make smarter decisions such as accepting internationally-tested products and listening to the farmers as opposed to the activities,” said Kumar. Manjunath explained the diffusion theory of innovation and explained the problems in adopting new technologies and brought forth the grey areas between organic farming and using biologically-altered seeds. Paranjape propagated the need for a strong continuous stewardship programme towards all stakeholders by citing the example of the heavily-debated BT brinjal, a seed developed in India but not allowed in the commercial market due to strong opposition from activists and policies. Building on the example, Choudhary highlighted the severe shortage of scientists and mass media propagating the truth about GM crops. The Delhi smog was another topic of discussion. The panel delved into such solutions as shredding and spreading paddy straw waste, which is an organic fertiliser that increases moisture retention in soil. Altering farming practices was another suggestion put forth to stall such untoward instances, although it was deemed impossible by the panellists. Geospatial technology and thermal tracking, along with precision agriculture, were highlighted as scalable steps in promoting a more sustainable form of farming using weather-based forecasting by the panel.